Welcome to the Poldark Trail. A self guided tour to visit all the Poldark filming locations in Cornwall used in the making of Series 1, 2 & 3. We will add new locations for Series 4 to the trail if new locations are used. The trail accompanies our Poldark in Cornwall feature page where you can view interviews with the cast, videos and information about the Poldark novels. We have numbered the locations for your convenience but you can start the trail at any of the points and follow it as a circular route. For the best experience and to give yourself enough time to enjoy visiting every location you should drive the trail over a minimum of 3 - 4 days. The important thing is that you enjoy the locations and the journeys between them so take as long as you require. The mileage for the whole trail is approximately 214 miles. Location names and other place names are linked for you to find out more information about particular places. Some visitor attractions and pubs are also linked for your convenience. This trail is designed to be used when filming is not taking place but ff you happen to visit a location when filming is underway please respect the wishes of the actors and crew regarding when and where you should stand to avoid interrupting filming. If you require a base from which to explore or need accommodation along the route please see our Accommodation Directory for a wide range of places to stay. We hope you enjoy the Poldark Trail and recommend you take care when exploring old mine workings and clifftop locations. Levant with its working steam operated beam engine is owned by the National Trust and part of the Cornish Mining World Heritage Site. A famous Cornish mine for having many lodes which extended for more than a mile from the cliffs under the sea, Levant is known as a ’submarine’ mine. The constant threat of the sea breaking into the workings was just one of the many hazards that miners faced on a daily basis. The temperature, poor ventilation, difficult access and the sheer back-breaking work of extracting the ore made the miners’ lives very difficult and unpleasant. Although there is a tendency to ‘glamourize’ and romanticize these activities today, the reality for the people that worked in these mines often meant short lives, work-related illnesses and untimely deaths. Levant Mine suffered one such tragedy in 1919 when its man-engine broke sending 31 men crashing to their deaths. When you visit Levant remember the people who worked here and the sacrifices they made every day in removing that rich copper and tin ore from the rock under your feet. Levant features in Series 1 as Tressiders Rolling Mill. 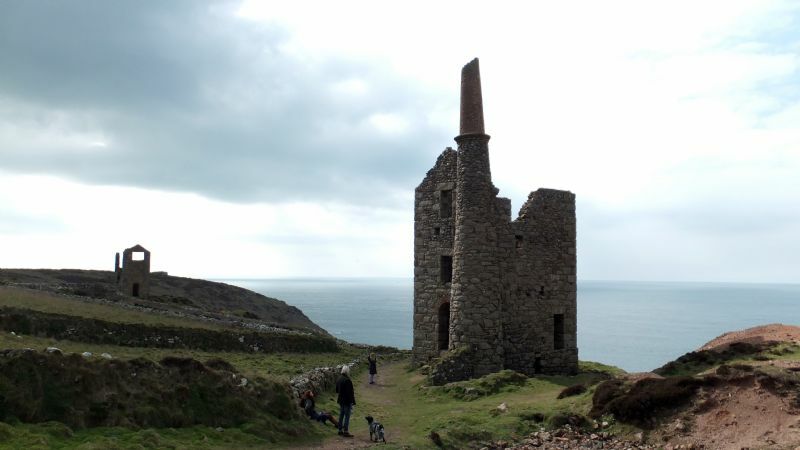 Botallack with its abundance of engine houses, calciner, labyrinth and mine chimneys is part of the Cornish Mining World Heritage Site. The Botallack calciner and labyrinth are relatively modern, being built in 1906. Tin ore would be roasted in a furnace in the calciner building further down the cliff to remove the impurities it contained and the smoke drawn through the labyrinth of tunnels which you can see today. Originally, the labyrinth of tunnels was fully enclosed. The arsenic settled out from the smoke onto the walls of the labyrinth and when the furnaces had been shut down and the tunnels had cooled children and bal maidens (female mine workers) would enter the labyrinth to remove the arsenic with little more than a cloth over their mouth and nose to protect them from inhaling this deadly poison. One teaspoon of arsenic is enough to kill six people. This by product of tin production became a valuable commodity in its own right being used as a pesticide, in sheep dips, pigments and dyes and in glass manufacture. During the 1870s less than six Cornish mines produced half the world’s arsenic. West Wheal Owles (pronounced ‘Oals’) produced over 8540 tons of black tin and 340 tons of copper between 1837 and 1893. At its peak in 1884 the mine employed 287 people - 105 underground and 182 on the surface. 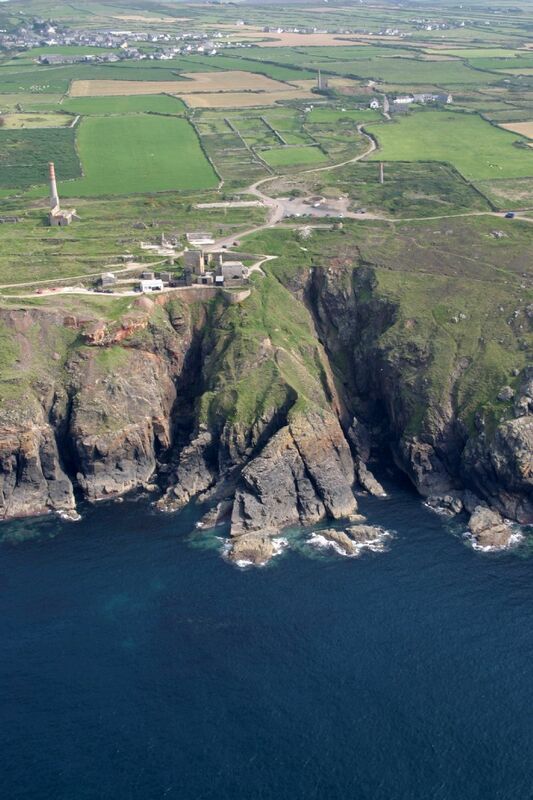 The mine was an amalgamation of several much older mines including Wheal Drea. It was Wheal Drea which proved to be its downfall when in January 1893 the miners broke into what is termed a ‘house of water’, the flooded workings of the former Wheal Drea mine. The huge surge of sea water which flooded into West Wheal Owles trapped more than 30 men. A few managed to escape but 19 miners and one boy were drowned. Their bodies were never recovered. You will see a plaque near the back of the engine house which commemorates those who lost their lives. Their names are: William Davey; William Eddy; James Rowe; William Roberts; John Taylor & Mark Taylor (brothers); James Edwards Trembath and Edward White who drowned on level 65; Thomas Ellis; Peter Dale; James Thomas; James Williams who drowned on level 75; Thomas Allen; John Grose &Thomas Grose (father and son); John Olds; William Stevens Thomas; Charles Hitchens Thomas; Lewis Blewett Wilkins and Edward Williams who died on level 85 of the mine. Miners worked under one of two systems. In ‘tutwork’ the miners would be paid by the piece, usually by the fathom. Under the ‘tribute’ way of working the miners would agree a price before the work started based on the estimated value of the processed ore. To get the work they would often tender a low price. If the lode was rich and the ore was extracted quickly then it was worthwhile for them but if the lode was poor and it took longer than expected to extract the ore they could easily find themselves making a loss. Mine owners would also charge the miners for sharpening their tools, the cost of ore processing and assaying. Miners bought their candles and blasting powder from the mine shop and to add to their exploitation, the mine owners would often issue them with tokens which could only be used to make purchases at the mine’s own shop. West Wheal Owles features as Ross Poldark’s mine, Wheal Leisure. Featured in Series 1, 2 and 3. In Series 2 Episode 4 the scene where Caroline Penvenen arrives in her carriage to address Dr Enys is filmed here. In Series 2 the mine is also dressed to become Wheal Grace, a copper mine owned by the Poldark family which Ross and Francis plan to reopen. West Wheal Owles, complete with CGI pumping engine, is featured as Wheal Grace in Series 2 Episode 5, where Ross and Francis are standing discussing their mine. In a later scene Ross is called away from the mine. Also in Episode 5 the scene where Nick Vigus leaves Wheal Grace after being hit by Ross and is seen walking away in the direction of the engine house of Wheal Edward while Captain McNeill observes him is also filmed here. In Series 2 Episode 6 the opening scene with Captain Ross standing in the mist is filmed at West Wheal Owles pumping engine house. Later in the same episode, the scene with Ross, Elizabeth and her son, Geoffrey Charles, on horseback is filmed on the path just beyond West Wheal Owles as they look towards the mine. The discussion between Ross and Captain Henshawe of the possible copper lode also takes place here. At the beginning of Episode 7 of Series 2, West Wheal Owles is featured in the scene with bal maidens dressing ore and Ross appears and examines a sample of rock extracted from Wheal Grace. Later in the same episode the silhouette of the mine engine house is filmed at West Wheal Owles. In Series 2 Episode 8 the scene where Captain Henshawe asks Ross to come to Wheal Grace to inspect the tin they’ve discovered is filmed at West Wheal Owles Pumping Engine House. Later in the same episode the scene where the horse and cart arrives with coal is also filmed here as is the scene where Ross emerges from Wheal Grace taking a drink from his flask and begins a conversation with Dr Enys and where the bodies of the dead miners are laid when they are carried from Wheal Grace. The neighbouring Crowns Engine Houses were probably the most photographed engine houses in Cornwall until this latest adaptation of Poldark. The Crowns section of Botallack Mine feature as Francis Poldark’s, Grambler Mine, which he loses in a card game to a friend of George Warleggan during Series 1. In Series 2 Episode 1 Francis and Elizabeth look down at the Crowns while discussing how he lost their mine. On leaving Levant turn right onto the B3306. Enter the village of Botallack from the St Ives to St Just road (B3306) and take the first road to the right which passes between several stone cottages. There is a small silver coloured National Trust sign pointing you in the direction of the car park. Follow the road as it curves left and the road now becomes a track. Continue along the track ignoring the first tracks to the left and right. You will pass a small building on your right. Continue to pass the Botallack Mine Count House now a National Trust Visitor Centre and shortly after the building next to a high stone wall turn right into the car park. Botallack is situated on the north coast of the Land’s End peninsula only 8 miles from Penzance. The village has an excellent pub, The Queens Arms. A National Trust car park is available at Botallack adjacent to the Old Count House which serves as a Visitor Centre and Cafe with toilets. The car park is currently free but is due to become pay and display in the near future. Access the coast path by walking down from the car park. Once on the coast path, walk to your right for the famous engine houses known as The Crowns. Following the coast path leftwards takes you to West Wheal Owles which features as Wheal Leisure. Gwennap Head in its splendid isolation stands between Land’s End and Porthgwarra, providing fantastic scenery for a number of shots in Series 2 and 3. Leave Botallack village by driving through the village centre and rejoin the B3306. Follow this road into St Just. Drive through the centre in the direction of Penzance. For a short while you are on the A3071. Just outside St Just turn right for Land’s End and you are now back on the B3306. Follow this road past Land’s End Airport and after a while you will reach the A30. Turn right onto the A30. Follow the road through Sennen. After the village look for a left turn to Porthcurno, the B3315. Follow this road until just after a duck pond and then take the right turn signposted to Porthgwarra. Follow the lane down to the coast and then turn right and right again to take you into the car park. 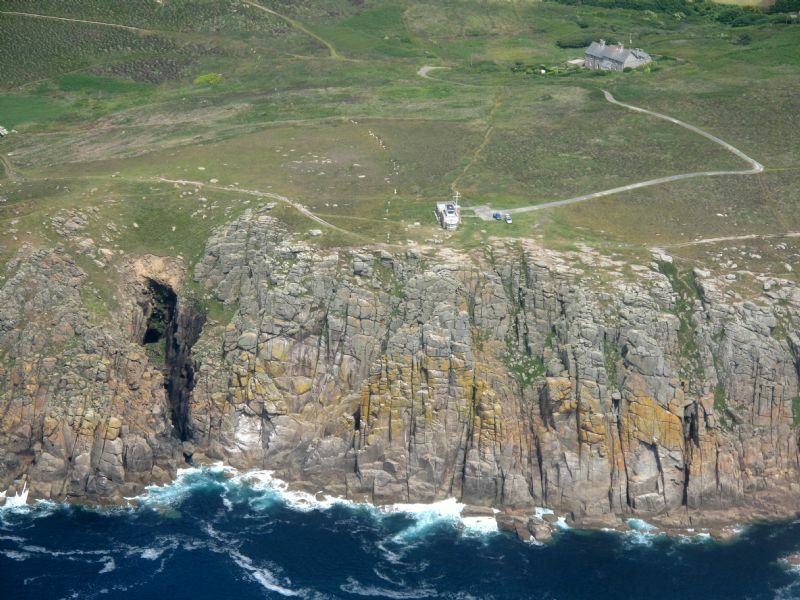 Gwennap Head is best approached from Porthgwarra. A paying car park is available. Walk along the coast path to access the headland or follow the track up the valley from its start point near the car park. Porthgwarra itself features in several scenes from Series 1 including the swimming scene where Ross is observed swimming in the clear water by Demelza watching him from the cliff top. The cave shown in the opening credits of Series 1 is the cave which runs through the cliffs between the two beaches at Porthgwarra. 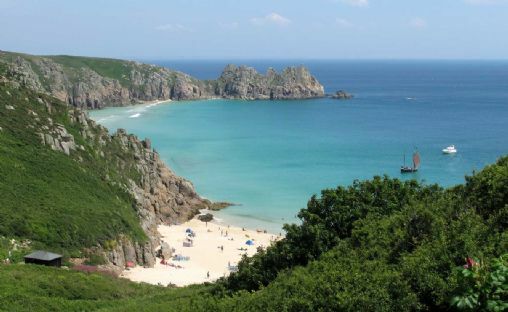 Porthcurno has two beautiful beaches. Porthcurno’s main beach with the stream running across it is accessed from the main car park and lies below the famous Minack Theatre. Pedn Vounder Beach lies at the far end of Porthcurno Beach close to Treryn Dinas the Iron Age Cliff Castle on which the famous Logan Rock is situated. Porthcurno Beach features as Nampara Cove in Series 2 during a lovely scene where Ross and Demelza are walking together on the white sand of this beautiful beach. In Series 2 Episode 2 Ross and Demelza are seen in a dream sequence together on Porthcurno Beach as Ross sits in Bodmin Gaol writing his letter to Demelza. In Series 2 episode 3 Demelza walks alone on the beach. Leave Porthgwarra on the same road as which you entered. When you reach the B3315 turn right towards Porthcurno. After a short distance turn right and follow the road into Porthcurno. There is a large pay and display car park in the valley just above the footpath to the beach. Turn left into the car park. 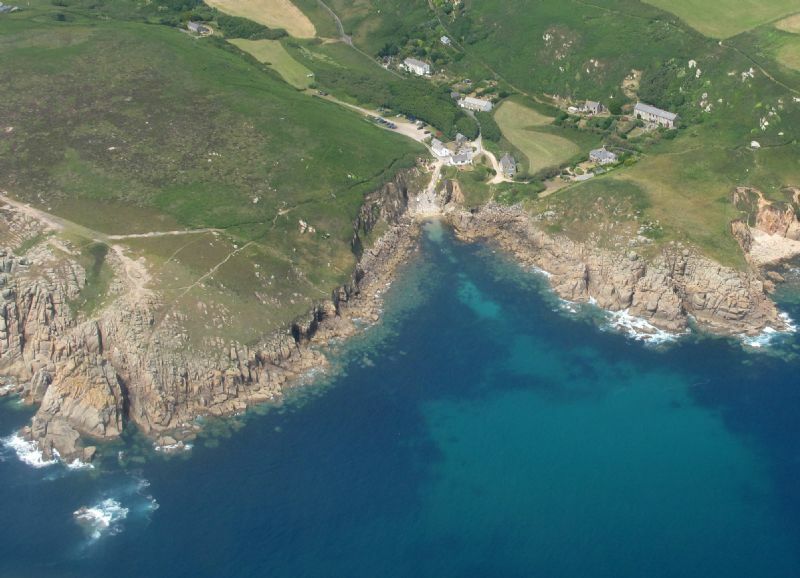 You can also access Pedn Vounder Beach from the coast path by parking in Treen village. The car park is at the end of the road after the picturesque pub, the Logan Rock Inn. Follow the public footpath to the coast and then on the right of Treryn Dinas Headland take the coast path to your right towards Porthcurno and follow the steep path down to the beach. 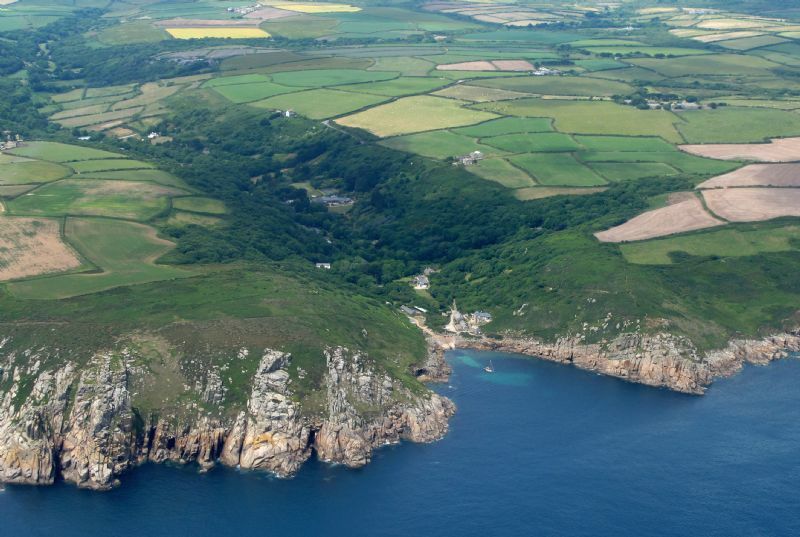 Penberth Cove is a delightful fishing hamlet on the south coast of the Land’s End peninsula. In Series 2 Episode 1 Prudie Paynter is approached by Tankard to give evidence against Ross while she is washing clothes in the stream. Later in the same episode Tankard approaches Jud Paynter. Further in the episode, Jud is drunkenly singing as he walks on the slipway at Penberth Cove, where he is again approached by Tankard. In Episode 3 Penberth is again depicted as a small hamlet bustling with activity with clothes being washed in the stream, while Caroline Penvenen, Unwin Trevaunance and Horace the pug pass by in a carriage. In Series 2 Episode 5 the arrest scene of the smuggler, Ted Cargeek, by red-coated soldiers is filmed here as is the scene where Dr Enys is treating a sore knee and discussing the possible informant. Later in episode 5 Dr Enys is seen at Penberth discussing Nick Vigus then walking in conversation with Caroline Penvenen. In Series 2 Episode 6, the village scene exterior when Ross is discussing Mark Daniel with the leader of the smugglers Mr Trencrom is filmed at Penberth Cove. In Series 2 Episode 7, Ross arrives on horseback and greets Dr Enys as they cross the stream. Dr Enys then enters a building to visit his patient Rosina. Later in the same episode, the scene where Dr Enys is seen talking to Vercoe, the Customs Officer features Penberth Cove. Also at Penberth, Demelza arrives on horseback while villagers go about gutting fish, gathering ropes then Rosina falls and Demelza rushes to help her. When Demelza and Dr Enys leave the studio set, after attending to Rosina, the scene is at Penberth Cove, where Dr Enys runs across the stepping stones in the stream. Penberth also features in Series 3. Leave Porthcurno via the same road as which you entered. When you reach the top of the valley turn right. The road goes down a hill. Penberth is best accessed by parking at the car park in Treen (Sat Nav TR19 6LF) and walking the short distance down the public footpath to Penberth. There are no car parks at Penberth Cove and on road parking is extremely limited. If you are in need of refreshment there is an excellent pub at Treen, The Logan Rock Inn. Gunwalloe has three locations which have been used in Series 1, 2 & 3. 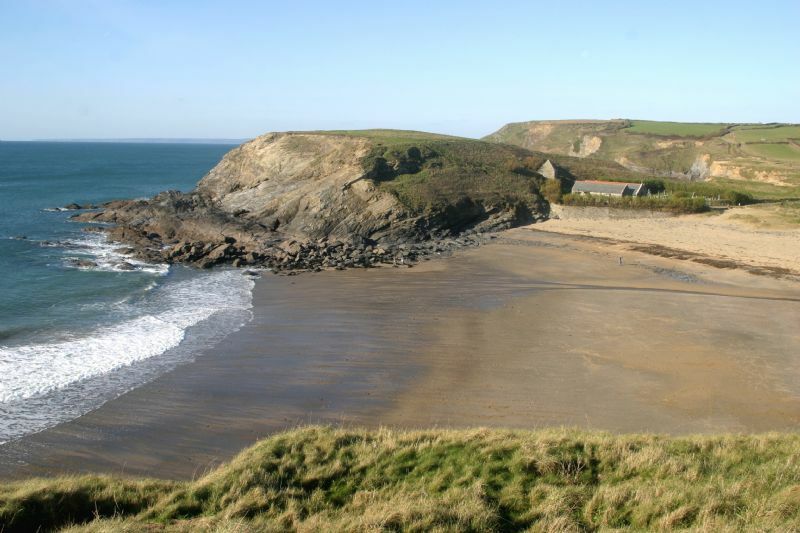 Church Cove, the large beach adjacent to St Winwaloe Church features in Series 1 in the shipwreck scene. The second beach at Gunwalloe is Jangye Ryn or Dollar Cove is a narrow beach with sand and rocks to the right of the church. This beach features in Series 2. The small stone house on the coast seen in Series 2 Episode 1, where Ross and Dr Enys discuss the upcoming trial is beside the coast path near Fishing Cove at Gunwalloe. If approaching down the lane walk to the right to find it. In Series 2 Episode 6 the scene of the exterior of Dr Enys's house is filmed near Gunwalloe Fishing Cove. In Series 2 Episode 7, the scene where Dr Enys walks towards his home beside the sea is flimed near Fishing Cove at Gunwalloe. The exterior of the Dr's cottage is filmed here. The interior is filmed in the studio. 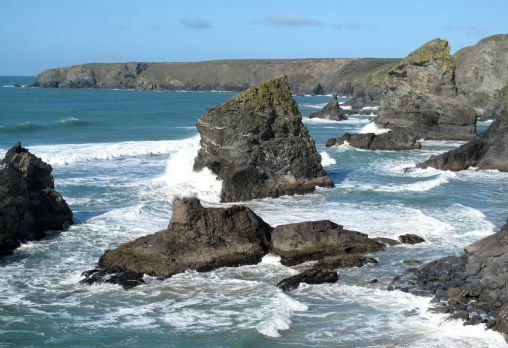 Later in the same episode, the ambush scene where Customs Officer Vercoe is waiting for the smugglers is filmed at Dollar Cove (Jangye Ryn) at Gunwalloe. Dr Enys lights a signal fire to warn Ross and the smugglers relaunch, while Dr Enys is knocked unconscious by a soldier. In Series 2 Episode 8, the scene where Dr Enys receives a delivery of a bundle of returned letters from Caroline is filmed near Fishing Cove at Gunwalloe. After exploring Penberth Cove return along the public footpath to the car park. Leave on the same road as which you entered and turn right onto the B3315. Take this road towards St Buryan. After a while it becomes the B3283. Keep following this road until it meets the A30. At the junction turn right towards Penzance. You now have a drive of around 26 miles along the A30 and A394 to Helston. There are plenty of opportunities for places to stop en route for refreshments including Penzance and numerous small towns and villages. After Helston follow the signs for The Lizard from the roundabout near Helston Community Hospital. You will join the A3083. As you are passing RNAS Culdrose take the right turn signposted to Gunwalloe. (If you reach the roundabout at the end of RNAS Culdrose, you have just missed the turn). Follow this road towards Gunwalloe. When it meets a junction near the village take the left turn, pass a pub and follow the road down along the coast until you reach the National Trust pay and display car park at Winnianton Farm. 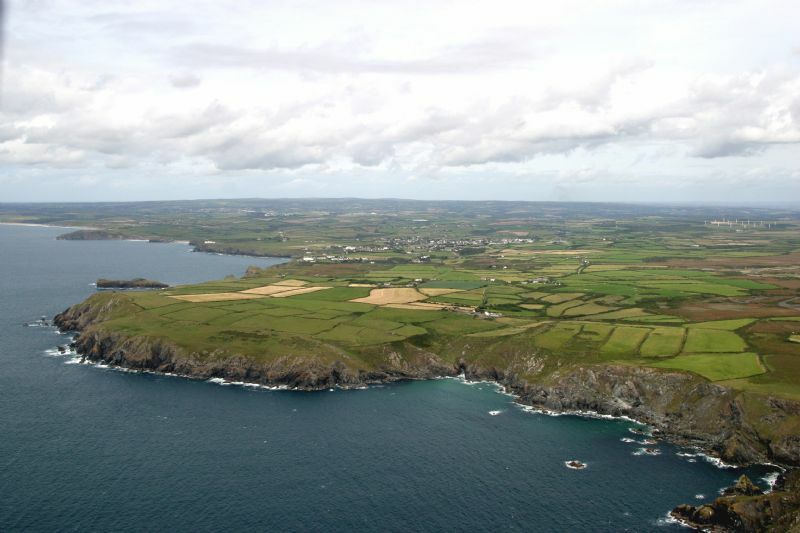 Predannack Wollas and its coastline near Mullion have provided a dramatic backdrop for many of Captain Poldark’s scenes on horseback. Leave Gunwalloe on the same road as which you entered. When you reach the A3083 turn right in the direction of the Lizard. After a while you will see a sign to the right for Mullion. Drive through Mullion and head towards Mullion Cove. Take a left turn towards Predannack and follow the road to the National Trust car park at Predannack Wollas. 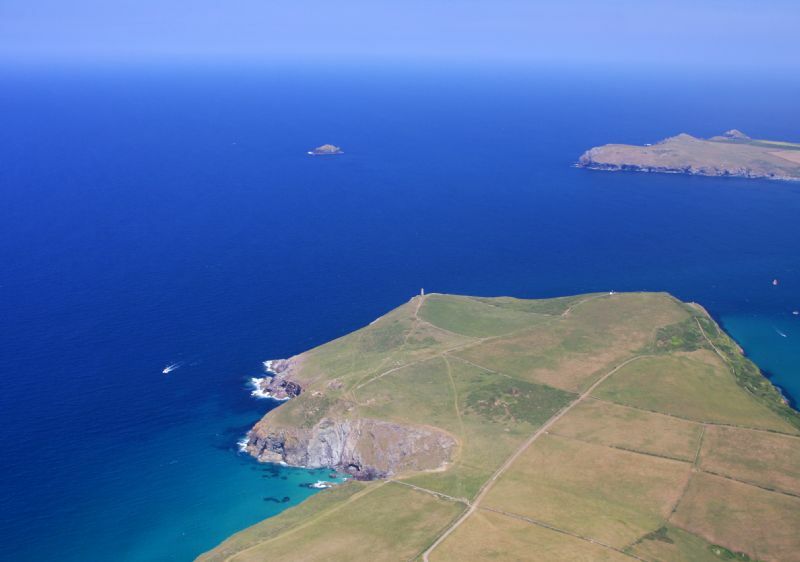 A series of public footpaths will take you out onto the wild, dramatic coastline. Kynance Cove has an idyllic beach with fascinating rocks and stunning cliff scenery. It was also used as a filming location for. ‘And Then There Were None’. In Series 2 Episode 3 Demelza is seen gathering driftwood on the beach at Kynance Cove while being watched by Captain McNeil. It also features in Series 2 Episode 4 as Nampara Cove, where Demelza takes their boat out to catch fish. Later in the episode the dramatic scene of Ross and Demelza in the waves is filmed here. During the filming of the boat scene it is reported that Aidan Turner was hit in the head by the boat, dropping Eleanor Tomlinson into the water and one of the camera men suffered a concussion. Leave on the same road on which you entered then as you reach Mullion follow the one-way system then drive back to the A3083 and turn right towards the Lizard. Follow the A3083 until the sign for Kynance Cove and then turn right. Follow the road to the National Trust car park. A footpath leads you down to the beach. Turnaware Point and the River Fal towards Trelissick are used in Series 3 probably in the rescue scene from Winston Graham’s fifth novel ‘The Black Moon’. The actors were seen in photographs taken on the Fal River near Turnaware Point in a long rowing boat, probably a Cornish gig being. (Please note they are not in this photo above). Retrace your steps back to the car park at Kynance Cove. Drive back to the A3083. You now have a drive of up to 44 miles (if you do not use the ferry) to the next location so you may wish to break the trail for the day. Turn left onto the A3083 to Clodgey Lane. At the roundabout you encountered earlier go straight on onto the A394 road towards Falmouth. Stay on the A394 until you reach a major roundabout near Penryn. Take the A39 in the direction of Truro. When you reach the large roundabout near Carnon Downs take the final exit following the signs for Trelissick. If you wish to travel to Turnaware Point you will need to take the ferry then take the B3289. Stay on the B3289 for a couple of miles then turn right onto the minor road and continue to the end of the road past Roundhouse Barn Holidays. There is a small amount of on-road parking. You then need to walk down the footpath to Turnaware Point. 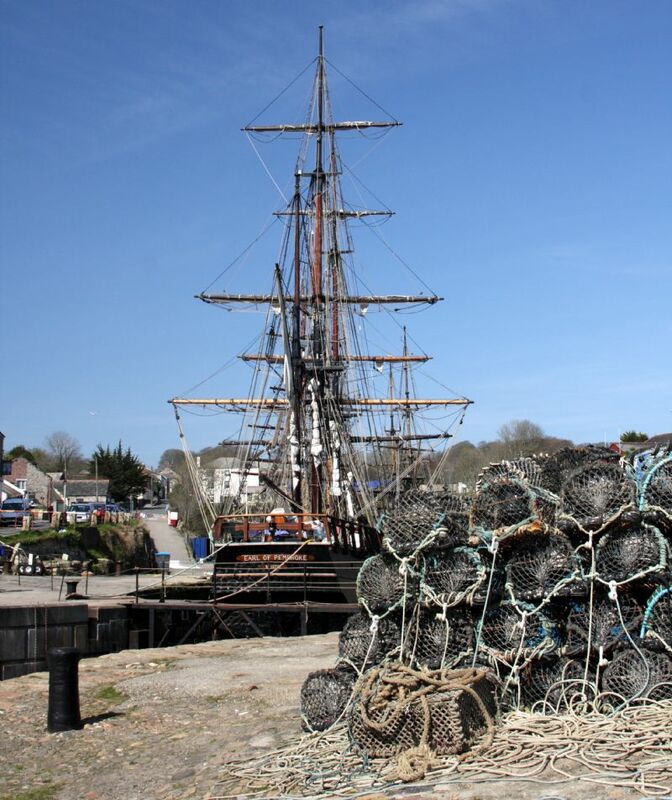 Charlestown is unique in Cornwall in having a harbour and square-rigged vessel which has provided sets for the film industry for over 30 years. All port scenes in Series 1 and 2 are filmed at Charlestown. Charlestown features in Series 2 Episode 4 the scene with Ross, Captain Blamey and Francis is filmed here. Later, Ross and Captain Henshawe are seen at the port boarding a boat for the Isles of Scilly to find Mark Daniel. Rowing ashore to St Mary’s, Isles of Scilly is probably filmed on the beach off Charlestown, as is walking up the beach towards the town. After the conversation with Mark Daniel the scene walking back towards the rowing boat is filmed at Charlestown. If you have travelled to Turnaware Point you will need to drive back along the minor road to the B3289. Turn right onto the B3289. After a short distance turn left onto the A3078. Remain on the A3078 until you reach Tregony then turn right onto the B3287. Follow the B3287 to its junction with the A390. Turn right onto the A390 towards St Austell. When you have driven around the outskirts of St Austell you reach the Mount Charles roundabout. Take the 3rd exit onto the Charlestown Road. Continue into Charlestown where there is a car park on your right. If you travelled to Trelissick and you do not wish to use the ferry then drive back the way you came along the B3289 to the A39. Then turn right towards Truro. When you reach the outskirts of Truro at the double mini roundabouts take the 3rd exit on the first roundabout and the 2nd exit on the second roundabout to join the A390 in the direction of St Austell. Stay on the A390 until you reach the Mount Charles roundabout on the outskirts of St Austell. Take the 3rd exit onto the Charlestown Road. Continue into Charlestown where there is a car park on your right. On a day with little traffic this journey takes around 35 minutes. 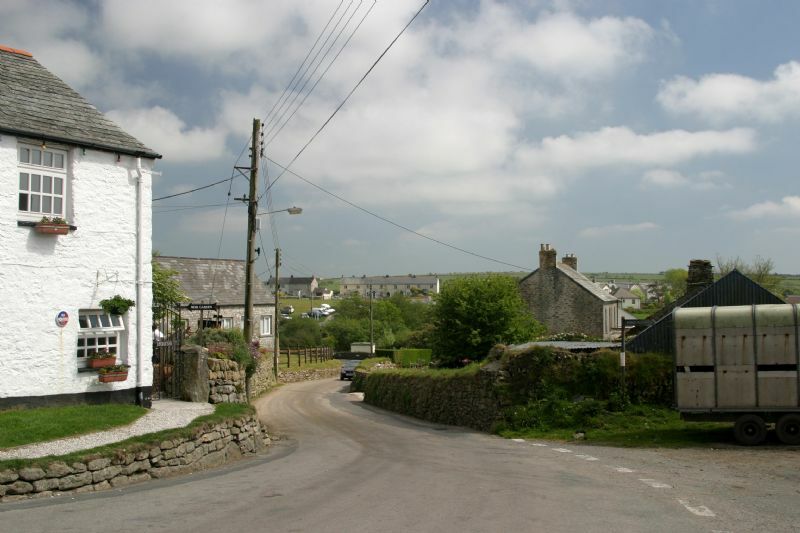 Minions is a tiny village on a highpoint on the east of Bodmin Moor. It has several stone circles, the famous Cheesewring and a number of tors and moors. Craddock Moor within a short walk of Minions featured in Series 1 as the place where Ross alighted from the carriage when he returned home from the war. The location is on the eastern side of Bodmin Moor, a drive of around 22 miles (approx. 40 minutes) from Charlestown. Take the Charlestown Road back to the roundabout and take the 3rd exit for the A390 in the direction of Lostwithiel. Continue on the A390 through Lostwithiel and as far as East Taphouse where you turn left onto the B3260. Turn right onto the A38 and almost immediately take the left turn onto the minor road towards Redgate, Common Moor, Golitha Falls and Minions. Continue along this minor road until you reach Minions. There is a small car park near the village and easy access to walk onto the moor. St Breward plays a very important part in Series 1 and 2. The Poldark’s family home of Nampara is based on a cottage within the parish of St Breward. All the exterior shots of Nampara feature the cottage at St Breward. Interior shots are filmed elsewhere. The cottage is privately owned and on private land. From the car park return along the minor road until you reach a right turn for Golitha Falls. Follow this minor road which follows the River Fowey all the way to Bolventor on the A30. Take a slight left to join the A30. After a short distance take the right turn to St Breward. Bodmin Moor is a large area of moorland including many tors and secluded areas. 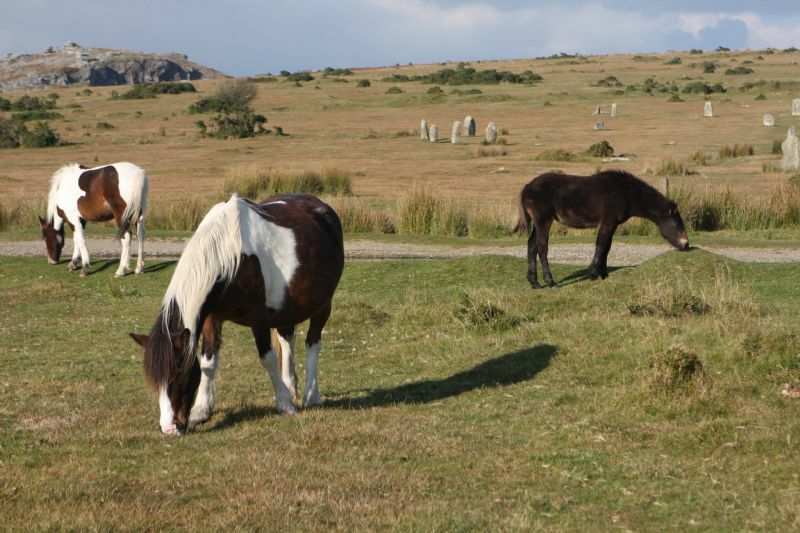 Many scenes of the cast on horseback are filmed using the backdrop of Bodmin Moor. There are many areas of beautiful moorland just a short drive from St Breward. The area near Rough Tor is also used for horseback scenes. Rough Tor is near Camelford. In Series 2 Episode 1 Ross is seen galloping on horseback across moorland towards a tor before being joined by Dr Dwight Enys as they make their way to the Assizes at Bodmin. This view is on moorland near Rough Tor and Stannon Moor. In Series 2 Episode 5 the scene where Verity is in a carriage making her way to Trenwith is filmed on Bodmin Moor. In Series 2 Episode, the scene where Dr Enys gallops on horseback to meet Caroline Penvenen is filmed on Bodmin Moor near St Breward. Follow the minor roads across the moor towards Watergate and Camelford. Shortly after passing Watergate you will reach a cross roads where you should turn right. Follow this road for a short distance into the car park for Rough Tor. 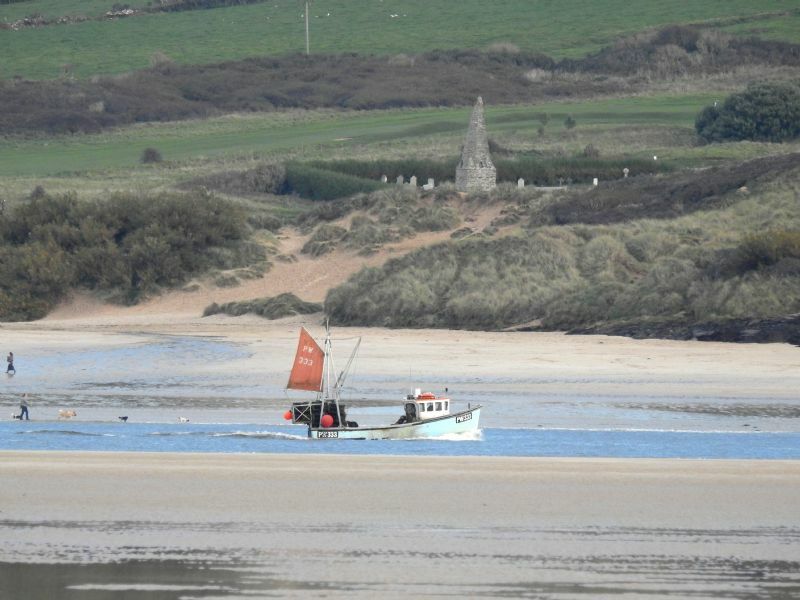 Hawker’s Cove has a lovely beach which extends to the River Camel at its estuary near Padstow. From Hawker's Cove there are wonderful views across the estuary towards Daymer Bay and St Enodoc. Hawker’s Cove features in Series 3. 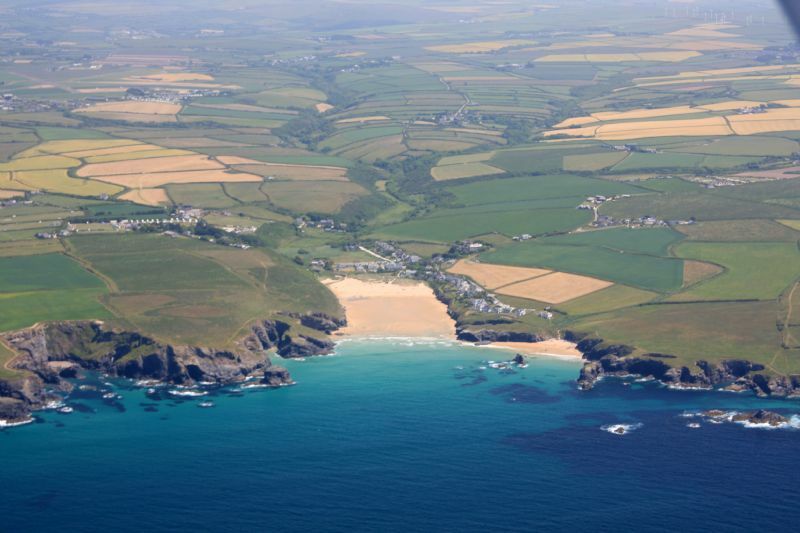 You will now head over to the north coast of Cornwall near Padstow. Take Rough Tor Road to the A39 at Camelford. Turn left onto the A39. Continue on the A39 past Wadebridge until you see a right turn onto the A389. Follow the A389 through St Issey towards Padstow. When you reach the outskirts of Padstow exit the A389 to the left onto the B3276. When you reach a crossroads go straight on following the minor road towards Crugmeer and Hawker’s Cove. There is a car park entrance to your right shortly before Lellizzick. Walk down to Harbour Cove and Hawker’s Cove is just to the left of Harbour Cove. From the same car park you can walk out onto Stepper Point. Walk back to the minor road and turn right. Continue past Lellizzick Farm until the road ends then follow the footpath out on the cliff top above the estuary towards Stepper Point. Stepper Point and the stunning cliffs surrounding it have featured in Series 1 and 2. There is an NCI Lookout on Stepper Point. The whole walk provides fantastic views of the Camel estuary and across the river to Daymer Bay, St Enodoc and Pentire headland. Porthcothan has a beautiful sandy beach at low water which widens to include two smaller beaches on either side of the bay. 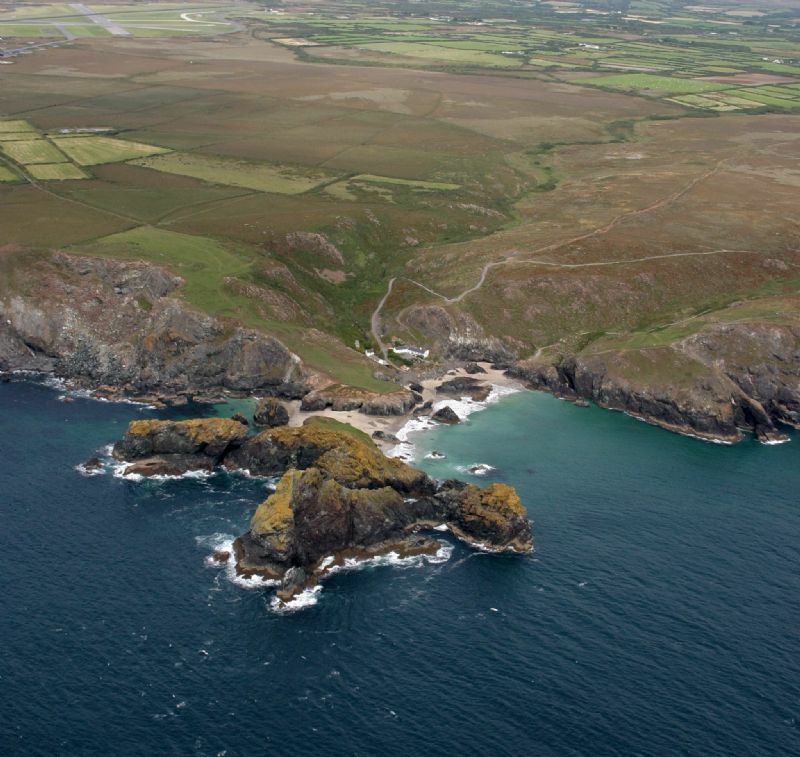 Porthcothan has featured in Series 1 and 2 as land belonging to the Poldarks, Nampara Cove. Retrace your steps to the car park. Your next location is about 6 miles away which should take around 15 minutes. Follow the minor road back to the B3276 then turn right in the direction of St Merryn. 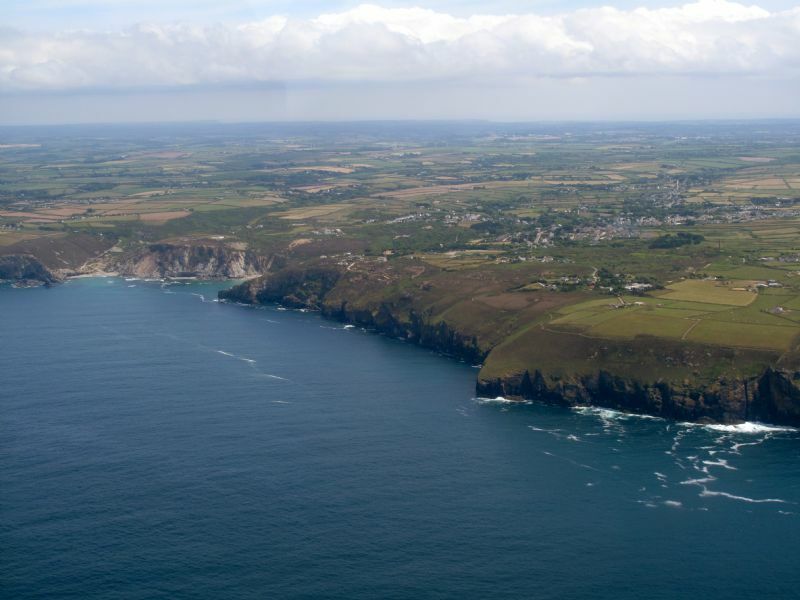 After around 6 miles you will arrive at Porthcothan. Drive past the entrance to the beach and just after turn left into the pay and display car park (1st Nov to 14th March No charge). Park Head with its dramatic cliff scenery has been featured in scenes of Ross Poldark galloping on horseback across the cliffs. Park Head has featured in Series 2. In Series 2 Episode 6, the scene where Dr Enys is riding along the clifftops on his way to visit Caroline's guardian, Ray Penvenen, is filmed at Park Head looking towards bedruthan Steps. Return to the car park at Porthcothan then drive back to the B3276 and turn left. Follow the B3276 for 1.4 miles then turn right up a lane to the National Trust car park for Park Head. 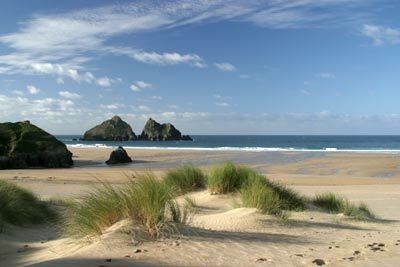 Holywell Bay with its stunning sandy beach backed by dunes is featured in Series 2 and 3. Holywell is featured as Warleggan land. In Series 2 there are dramatic scenes of Ross Poldark, Dr Enys and Caroline Penvenen riding on horseback along the waves breaking on the sands. Holywell Bay features in the opening scene of Series 2, Episode 5 where two young boys are running across a sandy beach. Later in episode 5 as Francis clings to the rock to avoid drowning the dream sequence of a the young Ross rescuing Francis from the waves on the beach is filmed at Holywell Bay. In Series 2 Episode 6 the scene with Dr Enys, Rosina and the body from the shipwreck washed up on the beach is filmed at Holywell Bay. Later in the same episode, Dr Enys and Caroline galloping across the beach and into the sand dunes on horseback is also filmed at Holywell Bay. In Series 2 Episode 7, the scene where Jud discovers the body of the informer, Charlie Kempthorne, lying dead on the beach, is filmed at Holywell Bay. In Series 3 the caves on the left side of the beach are used and the area of beach near The Monk. Sat Nav TR8 5PF. Holywell Bay is 13.5 miles away from Park Head, a drive of approximately 35 minutes. Return to the B3276 and turn right. Remain on the B3276 until you reach the double mini roundabout on the outskirts of Newquay. At the first roundabout take the 2nd exit onto the A3058 then at the 2nd roundabout take the 1st exit onto Trevenson Road. After a while the road becomes Trencreek Road. When you reach the junction with the A392 turn right onto the A392. Follow the road downhill until you reach its junction with the A3075 and take the first exit to join the A3075. After a couple of miles turn right onto High Lanes following the signs for Cubert. Continue through Cubert and follow the Holywell Road until you reach a National Trust car park on your left. The car park is sometimes pay and display and other times attended by volunteers. 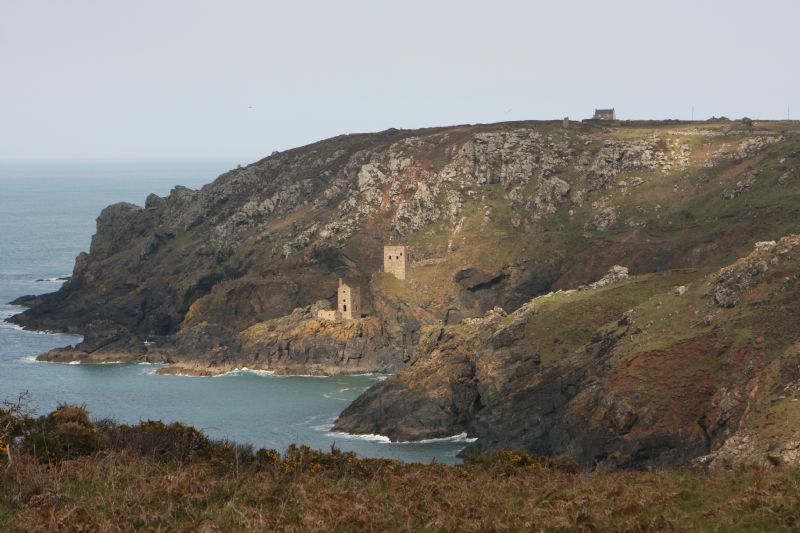 St Agnes Head and adjoining area with its magnificent clifftop scenery and mine engine houses is featured in Series 1, 2 and 3 during many clifftop scenes. From the car park drive back along the Holywell Road to Cubert and back to the A3075. Turn right onto the A3075. Remain on this road until you reach Chiverton X roundabout. Take the 4th exit onto the B3277 in the direction of St Agnes. When you reach the mini-roundabout at the edge of St Agnes, take the 1st exit. At the X roads continue straight on. When the road forks, ignore the left for Chapel Porth and follow the road to the right along Beacon Drive. After a few minutes turn left to follow the lane down to St Agnes Head. There are large areas available for parking free of charge.